370 pages | 130 B/W Illus. Acknowledgements. List of Contributors. 1. Merion Friends Meetinghouse 2. Timber Fundamentals 3. Timber Tension 4. Timber Bending 5. Timber Shear 6. Timber Compression 7. Timber Trusses 8. Timber Lateral Design 9. 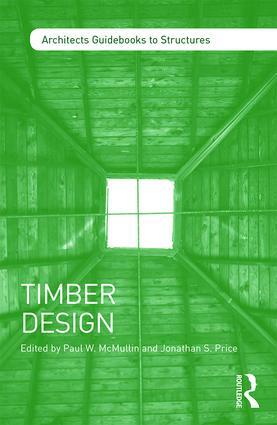 Timber Connections Appendix 1: Section Properties Appendix 2: Timber Reference Design Values Appendix 3: Connection Reference Design Values Appendix 4: Adjustment Factors Appendix 5: Simple Design Aids Appendix 6: Beam Solutions Appendix 7: List of Units Appendix 8: List of Symbols Appendix 9: Imperial and Metric Conversion Tables Glossary. Image Credits. Bibliography. Index. Paul W. McMullin is an educator, structural engineer, and photographer. He holds degrees in mechanical and civil engineering and is a licensed engineer in numerous states. He is a founding partner of Ingenium Design, providing innovative solutions to industrial and manufacturing facilities. Currently an adjunct professor at the University of Utah in Salt Lake City, USA, he has taught for a decade and loves bringing project-based learning to the classroom. Jonathan S. Price is a structural engineer and adjunct professor at Philadelphia University in Pennsylvania, USA, where he was honored with the Distinguished Adjunct Faculty Award in 2006. He holds a bachelor of architectural engineering degree from the University of Colorado, USA, a master of science degree in civil engineering from Drexel University in Philadelphia, USA, and is registered in 12 states. The Architect's Guidebooks to Structures series addresses key concepts in structures to help you understand and incorporate structural elements into your work. The series covers a wide range of principles, beginning with a detailed overview of structural systems, material selection and processes in Introduction to Structures; following with topics such as Concrete Design, Steel Design, Masonry Design and Timber Design to equip you with the basics to design key elements with these materials; and finishing with Special Structures Topics, presenting you with information on geotechnical considerations, retrofit, blast, cladding design, vibration and sustainability.